The past looms forebodingly throughout Boy A, threatening to capsize its protagonist’s fragile vessel of a life. It’s a lovely surprise, then, that the grace notes found within this artful character study have their roots in the pleasures and perils of the here-and-now. 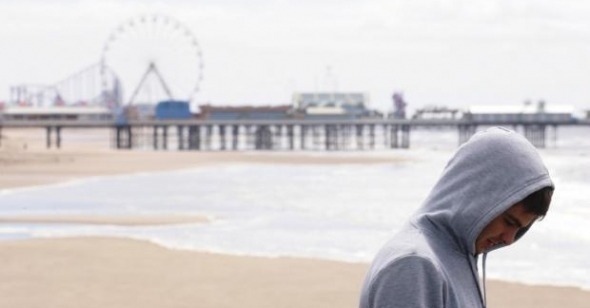 Directed with a fine eye for spatial detail by John Crowley and featuring a heartrending performance by newcomer Andrew Garfield, the film captures the minute fluctuations in intimacy and temperament, the hope and hesitancy, which define the opening pages of a new life chapter. If the possibility of exposure and rejection for bygone transgressions hums queasily under even the most blissful moments, such danger only intensifies Boy A’s clear-eyed pathos: the potential for devastation all the more reason to embrace momentary happiness. This desire to carefully yet vigorously make fresh marks on a slate temporarily wiped clean animates the life of Jack Burridge (Garfield). As the film begins, 24-year-old Jack has just been released from prison after serving a fourteen-year stint. Before reaching puberty, Jack (formerly known as Eric Wilson; his identity is changed to deter public ostracization) and unstable friend Phillip (Taylor Doherty) were both incarcerated for the brutal murder of a female classmate. The tabloid press seized upon their trial, emblazoning Jack’s smooth, pale face and wounded eyes on their pages alongside headlines decrying him and Phillip as living, killing embodiments of society’s evils. After spending his adolescence behind bars, Jack begins the daunting tasks of re-entering an unfamiliar world and piecing together the remains of an unlived life. He’s guided by wry, straight-shooting social worker Terry (a movingly restrained Peter Mullan), whose “one-day-at-a-time” mentality and quiet paternal affection fill the familial vacuum left by Jack’s now-absent parents. To protect against retribution from the murdered girl’s family and unwanted harassment by the media, he vows to never reveal his prior conviction. Thus Jack’s poignant dilemma: his present life remains unsullied so long as the past is never acknowledged. It’s a disconnect somewhat disconcertingly echoed within the film itself. Adapted by Mark O’Rowe from Jonathan Trigell’s novel of the same title, Boy A takes little interest in passing judgment upon Jack for his crime. The violent act itself occurs off-screen, and both the specificities of Jack’s involvement and the motivations behind it remain oblique. Ambiguity is always preferred over finger-wagging moralism, but here it produces some questionable results, flirting with the line between openhearted empathy and willfully glossing over unpleasant truths to maintain audience sympathy. If one accepts that Crowley and O’Rowe privilege the “how” of human interaction over the “why” of transparent character psychology, however, the rewards of following Jack’s delicately observed post-prison trajectory are plentiful. With Terry’s help, Jack moves in with Kelly (Siobhan Finneran), a kindly, frazzled woman who has agreed to temporarily put him up, and secures a job at a delivery company. Longing for connection but painfully shy, Jack nevertheless strikes up a jocular friendship with fellow employee Chris (the charming Shaun Evans) and finds himself gently pursued by the company’s good-natured secretary, Michelle (Katie Lyons). These blossoming relationships, combined with continued check-ins by Terry, begin to move Jack toward a relatively stable and even contented existence. Crowley manifests this transformation visually, with graceful compositions that tie physical space with emotional progression. In his first days out of jail, Jack occupies a world of constricting hallways and colorless rooms illuminated with grayish light. An awkward night of clubbing with Chris and other fellow employees turns disastrous when Jack inadvertently swallows an ecstasy tablet. Crowley captures his lonely, spastic gyrations on the club floor (you can hardly call something this flaying and aggressive “dancing”) in a largely unbroken long shot, the wall’s reflective paneling contradicting the promise of self-erasure offered by the dance hall’s smoky, strobe-lit interior. Once his friendship with Chris and romance with Michelle solidify, the world expands outward to accommodate Jack’s personal development: car rides along winding rural pathways; a boy’s day out at an amusement park. Internal space, too, serves to frame Jack’s active engagement with others, particularly in a lovely scene where Jack and Michelle playfully snap photographs of one another while in the bathtub. What’s occurring onscreen is nothing less than the flowering of a human soul, and Crowley’s low-key elegance reminds us that directors of “small” films chronicling “ordinary lives” too often represent narratives of the everyday with pedestrian aesthetics. Boy A weaves Jack’s childhood throughout the narrative, shuttling between his current life and a decade-and-a-half earlier, when he first befriends Phillip. Intertwining past and present allows O’Rowe and Crowley to foreground the dangerous proximity one has to the other, while juxtaposing time and place to highlight the ominous parallels that stubbornly bind the two together. The details of Jack’s previous life complicate our understanding of his current progress, particularly when the vicissitudes of male bonding come under closer scrutiny. A pint-sized punk with a cruel streak, Phillip provided an example of charismatic, confident boyhood radically different from that of the introverted Jack; indeed, the film suggests that Jack’s participation in the murder partly resulted from not wanting to disappoint his friend. Yet their friendship was a genuine one, ribald and affectionate, and Jack continues to believe throughout the film that Phillip’s suicide was actually murder. In comparison, Chris proves an infinitely more stable individual, but he frequently places Jack in the sort of mischievous, quasi-legal scenarios (he’s the one who popped the ecstasy tablet into his mouth at the club) that underline Jack’s delicate balance between embracing new people and avoiding old patterns. Similarly, Terry provides the resolute care and attention Jack never received from his own father, seen briefly in flashback slumped in front of the television, a bottle close by. Terry’s frayed relationship with his own son, rife with long-held recriminations kept at bay by a steady flow of alcohol, points to the vaguely impersonal magnanimity that makes Terry a godsend to suffering strangers and a smiling mystery for those closest to him. A positive female presence is the only missing element linking past and present (Jack’s cancer-stricken mother is seen briefly in flashback, screaming at Jack to leave her alone.) Untouched by the uncertainties of previous events, Jack and Michelle’s relationship seems the one unquestioned good within the film. If their romance can be criticized as overly idyllic, it’s also tender and thrilling, the purest illustration of what Jack stands to lose should his secrets be revealed. I’ve purposefully held off commenting on Garfield’s performance until it could be discussed in conjunction with the character of Michelle. This is not to downplay the infinitesimal shifts in emotion and thought he conveys throughout the film, overwhelming anxiety intermingling with voracious neediness to suggest a man (a boy, really) in search of a stable self through which to channel his fears and desires. For all his immediacy of feeling, the trick to Garfield’s work here lies in how he reveals, in flashes, the conflicting identities jockeying within. These can sometimes be frightening: watch Jack’s face when he throws a drunken assailant off Chris and pummels him in a manner disturbingly similar to the thrashing administered by himself and Phillip to a group of schoolyard bullies. It’s in his scenes with Lyons, however, that Garfield discovers the charming, gentle lover hidden beneath Jack’s tic-laden exterior. His darting, hopeful glances meet her serene, expectant gaze, and the intimacy that results feels generous and lived-in, providing the film with a recognizably beating heart. The other shoe eventually does drop in Boy A, in a manner at once appropriate and a little contrived. Indeed, many elements begin to feel a touch schematic as the film moves toward its admittedly devastating finale. Tracking shots following Jack down narrow alleyways, train tracks, and boardwalks, which suggest his increasingly restricted options, guide the viewer with a dispiritingly heavy hand. And because Jack’s level of culpability in the crimes that return to haunt him remains hazy at best, one does not feel the grim, fatalistic pull encouraged in the film’s final moments. He’s more unfortunate waif than sorrowful, repentant murderer. Yet Boy A’s unfussy compassion stays with you. A pair of connected scenes continues to haunt me. Sitting amidst empty outdoor picnic tables, Chris quietly thanks Jack for his loyalty and kindness. Jack clearly wishes to reciprocate by revealing the unvarnished truth of his past, but restrains himself. The two sit in silence as the wind gently sways the empty landscape. As if carried by the breeze, we cut to a high angle shot of Phillip and Jack (then Eric) laying side by side on the slope of a grassy hill under a brilliant blue sky. After a few moments of banter, Phillip begins to reveal his history of sexual abuse, his voice audibly swelling with anger and betrayal. Crowley’s camera slowly tilts downward as Phillip recounts horrific experiences with his older brother, avoiding the sentimentalizing close-up yet highlighting the moment’s raw connection by slowly isolating the boys in the frame, until they seem to float in a calming sea of green. Taken together, the scenes are emblematic of a film that views daily life as inevitably darkened by the past’s mysterious shadows, yet defiantly possessing the potential for companionship, candor, and transcendence, even if it lasts but a fleeting moment.